Riekie opened in 1996 with one unit (unit 1) and we can now sleep up to 40 people. Only 2kms from the Malelane Gate of the Kruger National Park, Leopard Creek and Malelane Golf Courses. We are situated on 1 hectare of private, subtropical gardens in a security village. Private outside entrance to each unit with a private braai facility at each unit. Breakfast optional: English Breakfast served in dining room/ Take-away Breakfast may be ordered by 18h00. Small meetings, dinners and braai's at the lapa by arrangement only. Each cottage is equipped for basic self-catering: fridge, microwave oven, crockery, cutlery, linen & towels, DSTV 128 channels. Rooms are serviced daily except of Sundays and Public holidays. Fax & e-mail services available. 2 Lapa areas for groups to braai or eat together. Secure parking/located in a security village. Ideal for business, leisure and holiday makers. We cater for singles, couples, families and larger groups. Crystal clear swimming pool in beautiful garden. Pool table, volley ball net and board games available. Accredited by SA Tourism with a 3-star rating as Guest House from 1996. Awarded by Business Chamber: Business of the Year 2011 -Tourism. 2015 Lilizela Tourism Awards Provincial WINNER (3 Star Guesthouse). 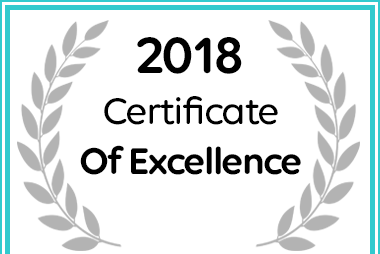 Selati 103 Guest Cottages received a 2018 Certificate of Excellence Malelane Self Catering Award. 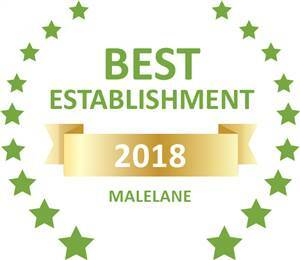 Based on reviews of establishments, Selati 103 Guest Cottages has been voted Best Establishment in Malelane for 2018. 100% tevredenheid.Ongelooflike lekker verblyf, sal niks wil verander nie, tuine pragtig, lieflike atmosfeer! Sal oor en oor terugkom. Love staying at Selati 103. It's always a pleasure to stay at Selati 103. The rooms are clean and comfortable and everything you could possibly need is provided. The staff are also always friendly and ready to help. We have stayed here many times and will definitely be back again! Well Rested. The staff at Selati are all very well mannered and will explain in detail if you have a query. Everyone has a smile, even if it is freezing outside. The room is neat and kept neat and you always have fresh clean towels. The Kitchenette is in the cupboard which is excellent when making that late night cup of coffee.DSTV with all the sporting channels and all the movie channels eases you into a relaxing state. The shower and bathroom are spotless and clean. The Kruger National Park is a quick minute away. Be sure to check for the leopard close to the entrance. Great experience and I will be returning again. Great Location. It is located just outside the Malelane Gate. Much cheaper than staying inside the Park. Accommodation is better than what is offered inside the park. Whether you stay inside or outside, you still have to pay the daily Conservation Fee. Lovely location - friendly reception, no-fuss booking!Room was comfortable and affordable. Excellent location - quiet, clean and safe. Good value for money - we selected the self-catering option and had all the necessary appliances (microwave, cutlery and crockery) making for a comfortable stay. This was my second stay and I have been impressed on both occasions. Family trip. Beautiful place well taken care off Definitely coming for a next visit friendly staff, although we didn't stay long but it was amazing I loved the fact that it's kids friendly and very close to Kruger national park. Always welcome. We would like to thank Anri and Essie for their hospitality, always on such short notice, for business purposes we will always overnight at Selati thanks for the wonderful breakfast and even when we not on time your understanding and the dinner ready in our rooms. Highly recommendable. Proximity to the Kruger park, independence of the accommodation, cleanliness, lush garden. Overnight en-route Mozambique -Selati 103 is the perfect place to overnight for either business in the area, leisure in the area or a an overnight spot en-route to a holiday destination. The property is neat, extremely well kept and maintained and the staff is fabulous. We spent 2 nights at Selati 103, and had everything we needed. Especially enjoyed sitting outside in the beautiful garden early morning with coffee. We also swam on the one day as the temp was 42 deg C, and we were most grateful for the aircon. Stayed in Unit 1. 4/5 Baie vriendelike diens. Skoon, netjiese plek. Goed geleë. 5/5 Waarde vir geld en baie netjies. Baie dankie vir 'n wonderlike ervaring. Goeie ontvang diens en plek is skoon en netjies. 5/5 Soos altyd lekker gebly. Ons gaan gereeld hier tuis en kon nog nooit enige rede vind om te kla nie. Altyd silwerskoon, netjies en vriendelike personeel. Sien julle beslis weer. Check-in: Friendly Staff,Lobby,Quick. Room: Clean,Spacious,Quiet. Location: Safe,Quiet,Convenient,Easy parking. Comments: Excellent property and good value for money. Well maintained and excellent staff. Exactly what we were looking for, for our visit to the Kruger Park. We stayed for 3 nights. We did not have breakfast there. Unfortunately no nice restaurants in the neighborhood, but all possible shops and fast food chains. 4/5 Overnight en-route Mozambique. Selati 103 is the perfect place to overnight for either business in the area, leisure in the area or a an overnight spot en-route to a holiday destination. The property is neat, extremely well kept and maintained and the staff is fabulous. 4/5 Dit was uitstekend. Die huis het genoeg ruimte en is goed ingerig. Ons het baie lekker gebly en sal enige dag weer hier oorbly. The prefect overnight base just outside Kruger's Malelane gate. It was 3 minutes away from a Kruger Park gate! The unit was large, well equipped for self catering and. There is lodge with a restaurant conveniently close too. We were fortunate enough to be the only guests at the house, so we enjoyed the lapa and the meticulously maintained swimming pool all for ourselves. 4/5 Family trip Dec 2017. Hi Riekie, Was good to stay with you again. Place was clean and tidy and the young girl at reception went out of her way to make sure all was good. Had a little hiccup with the washing but other than that absolutely no complaints. Look forward to our next visit. 4/5 Halfway to Kruger. Only one night arrived late, key was at gate no problem, left early in the morning before office open, no problem. Very convenient entry to Kruger and I can imagine one can stay there and go for day drives into Kruger. Great! Friendly, clean and 2kms from Malelane Gate. Didn't have breakfast. But the staff were lovely and the accommodation awesome! I will definitely stay there again, If you need to have dinner DEFINITELY go to Hamiltons 1km away - it was superb! Pretty guesthouse, Bedroom overlooking a small pool. Friendly welcome, secure parking. Not in the 'center' but the Kruger is 5 minutes by car. 4/5 Good accomodation in Malelane. Close to the Kruger entrance in a securised neighbourhood. Bedroom is small but enough for a night. Shower is clean. There is a swimming pool we do not have time to test. Reception is not in the same building but easy to find. 4/5 Location, Location, Location. Very near the Malelane Gate to Kruger Park. Grounds were beautiful and very quite at night. Two restaurants nearby. Front desk made our safari reservation for us in advance due to the holiday. Much appreciated. Room was well appointed and very comfortable. 4/5 Great place. Neat well built and tidy accommodation ,in manicured surroundings,inside security area. Situated around the bend of the Malelane bridge crossing the Crocodile river, close to the entrance to the Kruger National Park. 4/5 Selati 103 Guest Cottages - Tamboti 5. Tamboti 5 is a spacious unit with its own thatch roof lapa and braai facility, overlooking the swimming pool. The biggest advantage of this unit is that it is separated from the rest of the Tamboti house units and therefore fairly private. 5/5 Heerlik! Ons het al voorheen gebruik gemaak van Selati en sal dit beslis weer gebruik. Die plek is rustig, stil, goed ingerig en absoluut netjies met personeel wat vriendelik en behulpsaam is. 5/5 Very convenient for early start in Kruger and safe and neat. I would recommend it to anyone as it is clean, safe, and pleasant to stay there. Thanks. 4/5 Was kort maar lekker. Alles is baie netjies en op sy plek en Malelane is 'n baie goeie toeristebestemming en ek sal definitief weer gebruik maak van hulle. 5/5 Gem close to the Kruger National Park. This was my second stay at this wonderful establishment. I took the family with two small children, it was the perfect spot. Lots of space to run around and play, both units were luxurious and offered all we needed for self catering. Will definately visit again. 4/5 Ons het hier lekker familiereünie gehou en kon in die aand in die lapa kuier. Daar was plek vir ons almal in verskillende huise. Die ontbyt was lekker en een keer het Selati vir ons bederf met pap, sous, slaai en malvapudding saam met ons braaivleis, heerlik! Baie netjies en vriendelike personeel. 5/5 Het soos elke keer lekker daar gebly, so rustig en stil.Wonderlike rustige en stil plek. 5/5 Good value near the Malelane Gate. Friendly service, clean, comfortable and well-appointed rooms, at a reasonable price compared to most accommodation near the Kruger National Park. Only 5 minutes drive from the Park gate. Secure, peaceful and quiet, I found it excellent value for money. 5/5 Love and Care. We arrived with my husband being very ill. Everyone was concerned. We were treated with love and care and after three days (of the 9 days booked) he was still ill. We decided to return home. We were informed that we will receive a voucher for the six remaining days. This was sent to us via e-mail. They asked me to keep them updated on my husbands health. We were fortunate that, what might have been a slight stroke as the drs feared, was caused by kidney infection. The whole team at Selati 103, were so supportive that I never felt alone and affraid. I kept them updated and a soon as we can we will retrurn. This was the third time at the same unit and once we booked in at Tambotie house. This is really home away from home. 4/5 Prefect. The place was great family stay. It had everything we needed from a self-catering with attention to detail, and the garden was prefect for our toddler to run around and play in. Would definitely stay there again. Great location near Malelane gate. Beautiful and quiet location. We were received by a very friendly lady who gave us some lemons with the remark that they are good for you, on which I agree. The room was cozy, the decor is not my style but that's a very minor thing. The bathroom was quite big with a nice shower. There was a small corner with a fridge and some kitchen utensils, and a braai outside, as well as a common dining area outside (self-catering). Finally there was a swimming pool area with a nice view of the garden and a small playground. The garden was probably my favorite feature, this is a beautiful location with lots of green. We had dinner at Hamiltons Restaurant which is 10 minutes away, the servants were very friendly so I recommend that as well. Loveliest place! I would recommend to anyone. We loved it! We are 3 adults, a couple and one more person. They were very positive and great in communication. We checked in a little late, very accommodating to all our needs, very positive people. Very clean place, the breakfast quite great, we got additional breakfast and we chilled in the garden for a couple of hours after breakfast, great chilling :) I would definitely recommend. Beautiful place close to the Kruger and Mozambique border! I really appreciated the support from the staff. I was driving late at night and I got support until I arrived. 4/5 Lekker plek. Plek is baie mooi en netjies. Maak seker jou kamer is wel geboek. Laaste geval was ons gesin weggestuur omrede hulle sisteme nie op datum was nie, maar ons was onmiddellik gehelp en gestuur na 'n veilige netjies gastehuis en die verskil in prys is teruggegee aan ons as 'n 'voucher'. Baie vriendelike staff. Parkering is bietjie van 'n probleem as 'n mens ry met 'n trailer. Ligging is fantasties, net 2 km van die Malelane Hek na die Wildtuin. Comfortable Stay. The property was clean and convenient with good wifi reception. The owner was lovely to deal with. 4/5 Excellent. The team at Selati were fantastic the front staff made me feel at home away from home . 4/5 Baie mooi netjiese eenheid. Sal beslis weer die verblyf gebruik. 4/5 Affordable B&B in Malelane. After a shocking cost increase of my previous lodging I am glad to have found Selati 103. Close enough to town and the freeway and yet a tranquil environment with friendly staff and good accommodation. 5/5 Veral die ligging is 5-ster as jy die KNP wil besoek. Kliëntediens was 110%. 'n Gerieflike, skoon, netjiese selfsorgverblyf wat nie duur is nie. Sal enige tyd weer soontoe gaan. Geen klagtes nie. Highly recommended. We kindly got a free upgrade. The apartment was big, very clean and very comfortable. The location is great. A few minutes to the entrance gate of the Kruger National Park..
Great location. It is not far from Kruger Park. The whole area is secured and there is private parking. The staff is very nice and helpful. The room was clean. 5/5 Uitstekende verblyf! Baie netjiese en skoon eenhede wat goed toegerus is. Veilige parkering. Baie vriendelike en hulpvaardige personeel. Altyd ons nommer een keuse om oor te slaap as ons in daardie omgewing is. Baie goed! Skoon plek, mooi, stil, rustig, baie goeie swembad. alles werk en van goeie gehalte. 'n plek waarna ek vir seker sal terugkeer. Die ontvangs is half versteek en ons het die huis moeilik bereik. Wonderful cottages right at the entrance of Kruger park. The cottages are great and cosy. The staff is, too - we wanted to go on early game drives in the Kruger park and they agreed to shift breakfast for us so we wouldn't miss it. It's very close to the Melalane gate of the park. Looking forward very much to my stay with you in August and am so grateful to have a contact - you have been more than gracious in your replies. Netjies, rustig en die ideale ligging om verskeie dele in die Laeveld te verken. Baie dankie vir julle gasvryheid. Baie netjiese en skoon eenhede wat goed toegerus is. Veilige parkering. Baie vriendelike en hulpvaardige personeel. Altyd ons nommer een keuse om oor te slaap as ons in daardie omgewing is. 'Great Accommodation' - Everything suited my expectations very well. The place looked really good. The staff was great and the hospitality was brilliant. I would definitely go back. This place is definitely recommendable. First of all, the location is excellent with 2 km of the entrance gate Malelane to the Kruger park and to the connection to the N4. The house is located in a secluded secured residential district, which is also an advantage. The property, the buildings and leisure as well as community facilities are in a good and cultivated condition. The rooms are very well appointed, of course in the African style and very clean. I felt right at first. Even from gate opening to the closing in the park was and my breakfast in package form ordered, I'm convinced that you can also very good dine appetite. We stayed here a few years ago, also for wedding. I must say that this place is truly amazing. 3 star guest house, with 5 star service. This is by far the place that had the most value for money. We stayed in room 1, I didn't particularly like the bedding but that is only my personal taste, nothing wrong with it. So the reason I felt to write this review was the following: I asked the manager / owner if I could please borrow an iron, she then said that I can just give her the clothes that needed to be ironed and they will do it for us. I happily gave it to her. When about an hour passed and I started getting nervous, but they then delivered it and not only was it freshly ironed it was also washed and dried! This service is something you would expect from a 5 star establishment, I was very impressed. The room comes with a very cute kitchenette, that has everything you need and is of high quality. The breakfast was delicious and the gardens are taken well care off. We stayed for two nights and I would have easily stayed longer. Would absolutely recommend this establishment and I can't wait to return. Oct 2016 Robert & Sue Hargis - U.S.A.
A stone's throw from Kruger Park. For visitors to Kruger Park who travel from far, excellent overnight accommodation just under 1km from Malelane gate. The self catering accommodation is tastefully decorated, is very secure and reasonably priced. Stop between Maputo and Kruger Park. Well located, in a secure and closed area near the entrance of the Kruger Park. Because of the National Heritage Day we were toasted with traditional Pap and sheba (xima with tomato sauce). Good beds, very hot shower water, friendly staff. Nothing bad. In a strategic location, friendly and .... Unforgettable braai! Close to the Malelane gate. cozy and clean room (ours was a small bungalow with thatched roof behind reception, great location!). Friendly staff. Dazzling outer common area with table, provisions and pans, grill, sink and all the necessary equipment to do the braai (nearby Spar supermarket where to buy meat and charcoal). Beautiful communal garden with swimming pool and hammocks. Excellent value for money. Highly recommended! Friendly staff, perfect location! Perfect location, a 10 min drive to the Melalane Gate of the Krügerpark. The woman at the reception was really helpful and provided us with great information about the park. We loved the garden with the swimming pool and bbq area. Perfect location, a 10 min drive to the Melalane Gate of the Krügerpark. The woman at the reception was really helpful and provided us with great information about the park. We loved the garden with the swimming pool and bbq area. We liked the idea that the cottage is so near the Kruger National park. It was spacious and neat. The cottage is well equipped and makes self catering a pleasure. Absolutely fantastic facilities. We required 4 separate rooms and were easily accommodated. All rooms were very well equipped and maintained, cleaned daily and airconditioned. Very friendly, helpful staff. Good packed breakfasts - as long as there is no tomato on the sandwiches making them wet and inedible.Beautiful grounds, braai facilities, swimming pool and a superb full cooked breakfast. Thank you for a very memorable stay. We will certainly be back and definitely recommend 103 Selati Cottages for your stay in Malelane. The Staff on reception were very friendly, it was a peaceful location with beautiful surroundings, breakfast was great. Couldn't fault it! Great value for money! Would recommend to anyone. Great ambience, will definatley be back. Breakfast was so good a treat I forgot to ask for Baked Beans. Please reserve some for my next visit. Amazing, clean and neat cottage. We would recommend Selati 103 to anyone who wants a nice place to stop over to Moz/Swaziland or just looking for an alternative to the Kruger. Ideal for anyone travelling with small kids. Lovely experience indeed for 2 adults, 2 kids and ouma. Thank you so much for a lovely, relaxing stay. Would definatley come back to these lovely, green grounds. This place is more than just a beautiful place, staff is friendly, guests are happy. Cannot wait to come back...many thanks. Very impressed, clean, cool and beautiful. Staff excellent. Grote griet! Hier bly mens lekker! Dankie vir die lekker kospakkies. Cottages well constructed and neatly furnished. Wonderful garden settings. Easy access from N4 and almost at the (KNP) Malalane Gate. Excellent security. Great relaxing break. Welcoming staff very friendly. Will recommend to others. Ryk en gesellige dekor en vars kamer, het ons onmiddelik tuis laat voel. Baie dankie dat jul soveel aandag skenk aan detail. 'n Aangename verassing. Very good guest house which is well situated. The guesthouse is close to the Malelane gate and to the Swaziland border. The rooms are spacious and equipped with air-conditioning. The room decor is nice and clean. There's a swimming pool with secure parking. Beautiful gardens with big trees. The breakfast is good and the staff goes the extra mile for you. Enjoyed my stay at the guesthouse. We enjoyed our stay! The room was neat and the staff very friendly. We also enjoyed the short ride to the Malelane gate late afternoon to watch the sunset and animals coming down to drink water in the river. Absolutely awesome! The room was very affordable. What a nice place to stay! Thanks to Anri for the special treatment and personal attention. The rooms are very neat and comfortable with enough privacy. Meals were absolutely delicious and we were spoilt on my hubby's birthday. Will definitely visit again. Our room was very spacious and felt like home, was private, clean and comfortable and the facilities more than adequate. Thanks to the staff that were helpful and courteous at all times. This would be my second stay at Selati 103 hence my decision to review it. Enjoying wildlife, a benefit is the proximity to the Malelane gate.The self catering unit I stayed in was very well equipped . The kitchen back door led to the swimming pool that was a blessing in summer. The staff cleaned the room daily and it was a pleasure returning from the park to a clean house to enjoy lounging in the pool with a cold beer watching the fire burn to get ready for the nights braai! I have always been greeted friendly at reception and my booking handled very professionally upon enquiry. I will stay at Selati 103 again! Absolutley a lovely and tranquil garden - could spend hours here! A lot of lovely details being thought of in the cottage! Lovely! “posto ottimo, gestori gentili, vicinissimo al malelane gate” (Good place, nice owners, very close to the Malelane gate). Awesome plek! Totally unexpected. Sad its only one day. We will be back! Home from home, with all the comforts. Ons kuier hier sedert 2005 en sien uit na nog baie kuiers by Selati 103. Home away from home! I call it a Tropical fix because of the beautiful gardens and the wonderful bird life. The cottages were clean, cosy and comfortable and we felt absolutely safe. Getting up early and only travelling 2km to the Malelane gate is very convenient. I was pleasantly surprised by the reception and service we received at Selati 103. Not knowing this part of South Africa, and having heard it was very rural, the expectation was not high, but was I wrong! The rooms are set amongst beautiful gardens, close to the Kruger Park. We will definitely come again. I really enjoyed my stay at the Selati 103 Guest Cottages, the place is quiet and full of fresh air, and the service I received from the reception was also very good. I plan to come back again in the near future. Lovely stay. Friendly reception. Reception should stay open until at least 20h00 to allow for arrival of working guests. Otherwise a perfect stay. Very neat and very clean. Everybody extremely friendly. Beautiful surroundings and gardens. Excellent value for money. Highly Recommended! Very nice cottage and very quiet. Nice reception. Great explanation as to how to get there. We were welcomed by sincere and friendly people, in fact we felt like visiting friends. The room, kitchenette and bathroom were well kept and maintained. Overall, it was a first but not last visit, and we can recommend it to anybody who travels in that direction. Thank you. A lovely place to stay with a great pool, strongly recommended. Gardens spectacular. Staff very friendly. Substantial great breakfast. My family and l enjoyed our stay at Selati 103 Guest Lodge. We did not see it as a lodge, we suggest they call it Selati 103 Guest Homes. We felt at home, staff so welcoming, so neat, high standards and value for money. What a lovely Guest House. Very friendly and attentive owner Riekie. Checked in quite late but she waited for me. Breakfast was Great - Hot and a good variety, Served attractively. Rooms and most importantly the Bathrooms are spotless!! The amenities in the Room were sufficient - more than enough Tea, Coffee & Hot Chocolate for me to make numerous cups!!! Riekie allowed me to check out later than normal as I had a late meeting and needed to Freshen up. We stayed at Selati after winning their facebook competition. We were really impressed. The furniture and interior is very tasteful and of high quality. We loved the attention to little things which make your stay more comfortable. The breakfasts were wonderful and the staff very friendly and helpful. Dit was ook baie lekker om in Afrikaans gehelp te word. We would highly recommend the guest house and would definitely make use of it again. Adolf en Hendriette Laesecke. Room Tip: The luxury room is definitely worth it. Located less than a 5 min drive from the Malelane gate to Kruger Park, Selati 103 provides excellent accomodation. Good value-for-money cottages, with clean bathrooms, a private braai area, swimming pool and more amenities. Friendly, helpful and knowledgeable owner/manager. We experienced great hospitality at Selati 103. Our car broke down before we got there. When we called them they immdediately came to fetch us. We also needed to have an additional guest staying and they accomodated our request. Through out our ordeal with the car they were really concerned about us and gave us all the assistance we needed. I expected them to charge us for picking us up. Not only did they not charge us for it they also gave us a complimentary breakfast. The setting is that of tranquil and lots of privacy. As my daughter commented 'You feel like you have your own private home'. I strongly recommend this lodge. Beautiful place and wonderful people. The service and friendliness was outstanding. I will definitely be back there to stay again in the future! Jan 2014, Tracey Creevy S.A.
We found the accommodation very comfortable and clean. The whole resort is kept in excellent condition. Will definitely stay again when passing the area. “Great place and reasonable prices”. Reviewed 3 weeks ago. Traveled with family. We passed through Malelane on our way from Botswana to Tofu in Mozambique. Selati 103 was a stop over point. We found the rooms to be clean well appointed and perfectly functional. The staff were very friendly and very helpful. It is also evident that there is a significant security fence around the perimeter, so it is secure too. I would recommend this to anyone wanting good value for money in Malelane. “A nice clean and pleasant place to stay”. We found this hotel in the AA South African guide for accommodations. I was able to phone them and inquire about availability since we were not going to make it to Kruger National park that day. The lady at reception was very nice and gave directions to the place. We did not stay at the main guest house because it was full, but they have another house in the same gated community and we stayed there. The price was very reasonable and breakfast was optional. Very friendly and helpful people at reception, they gave us advise about best gates to leave the park etc and they also recommended a place to eat dinner nearby. This place is only 2 km, less than two miles from the Malelane entrance to Kruger National park and it is a very convenient place to stop for the night if you are not able to make it to the park before the park gate closes at 6 pm. Our room had a refrigerator, microwave and coffee maker. Beds were comfortable. This guest house is in a gated community of beautiful houses with beautiful gardens. We went for a walk in the morning and it was very pleasant. I would stay here again if I need a place near the park. Thanks for an amazing stay at Selati 103. 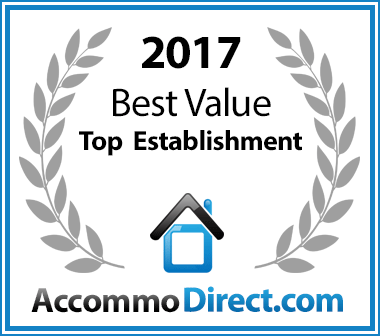 The accommodation was very clean & comfortable but the highlight was the very friendly and efficient staff and the spectacular gardens. Traveled with family, “Lovely and helpful”, We arrived late from England and stayed one night prior to entering Kruger. We were supposed to stay one night after our week in Kruger before flying back to Joberg early the following morning but because of road works we decided to book in somewhere closer to the airport. We received brilliant service in finding a place for us to stay . It was such a very nice start to our holiday. Everything was clean and tidy and the breakfast plenty. Dankie vir jul ongelooflike diens. Niks is te veel moeite nie. Ek sal jul lekker en skoon verblyf, wat amper op die Wiltuin is, enige dag vir enigiemand aanbeveel. June 2012 Sarah Manzie: Activities Galore in & around Malelane!! Malelane, in Mpumalanga, between Nelspruit and Maputo on the N4 has many activities to enjoy whilst on your holiday. Apart from having its own gate to the magical Kruger Park, there are many private game reserves that offer the following activities. Game drives - morning, sunset, all day; elephant back safaris, elephant interactions; walking safaris/bush walks; dinners in the bush; horse riding; quad biking; micro lighting; day trips to Swaziland, Mozambique and the Panorama Route. Around Malelane, are also picturesque towns such as Sabie, Hazyview, Graskop, Pilgrims Rest and Kaapsehoop where wild horses roam free and organisations like Jane Goodall's Chimp Eden. You will never be without something to do! For dining there are many exclusive restaurants in the area to keep your tummy full and also many accommodations who offer self catering facilities. Enjoy Malelane for all it has to offer, you won't regret it! Best service in town, I asked for breakfast to be prepared for me earlier time than normal and it was prepared for me in my fridge as I arrived late. I felt welcomed and the staff do go an extra mile with a warm smile. The rooms are clean with lots of space. Nice clean pool. home away from home. My stay was very short and next time I will definitely bring my family. May you continue do what you do & God bless Selati 103.